When I joined CTR (Central Telecine Room) at Alexandra Palace I became part of a crew of about six, and it was our job to show on transmission anything and everything originating on film. 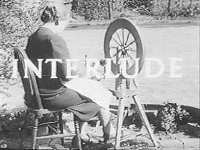 In those days television was on the air from 10am to 12noon with the 2-hour Demfilm, and then went off until the afternoon Women's programme at 3 o'clock. 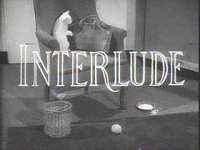 It then closed down again at 4pm until the 5 o'clock Children's programmes, and again closed down at 6pm until the evening transmission at 8. When Pat Chipperfield was promoted, Tony Cheale became shift leader. Ron Whatley was in charge of the other shift. So we showed the 2-hour morning Demfilm, and the 5-minute "tuning signals" before each transmission, that is at 5 minutes to 3, 5 to 5, and 5 to 8. This was accompanied on the soundtrack by the Fantasia on National Airs, or "Nat Airs" as we called it - and the variable area optical soundtrack is visible on the left of the picture frame. 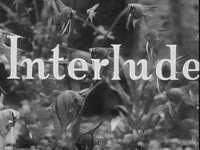 In addition, we showed any short or feature film that was scheduled, plus any film inserts for studio programmes. These studio inserts were usually run from the Mechau telecine in a little room near the studio - and at AP that was Studio A. A little "ritual" occurred at some point in the morning while Test Card C was being transmitted. Someone in CCR (Central Control Room) would phone down to the vision transmitter on the ground floor and ask how the "3 Megs" were that morning. Then the engineer would answer "Fine". 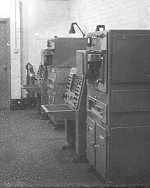 In the 405-line tv system developed in the mid-1930s by the Marconi-EMI research team headed by Isaac Schoenberg, the highest vision frequency transmitted was 3MHz, although few, if any, tv receivers of the time could reproduce that. 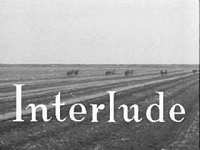 Also of course, there were the famous Interludes - these were used during intervals in plays, and also as a standby in the event of a breakdown in the studio, because with very few exceptions, all programmes were live. The one most fondly remembered is the "Potter's Wheel" and the first piece of music on the soundtrack of this was "The Young Ballerina" by Charles Williams. To "help" Presentation I scratched on the number 10 frame of the leaders (the one we showed in the gate) the name of the Interlude so that those upstairs would know which one was ready. - until I prepared another, separate leader with a different name scratched on it which I loaded into the other scanner and periodically changed over..... This was somewhat unsettling to the confidence of the poor folk in Presentation! In the periods when television was off the air we would rehearse any film that was later to be shown on transmission. 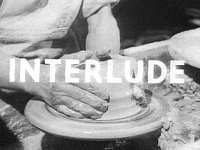 One day Jack (Kelleher) was rehearsing a feature film on Cintel and Ron (Williams) was loading the reels for him. Unbeknown to Jack, Ron had substituted a reel of film leaders in place of Reel 2 of the film. 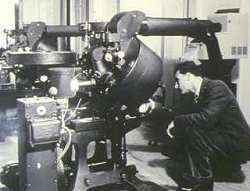 Almost all film transmitted was on 35mm, but there was a pair of 16mm telecine film scanners, made by Pye of Cambridge. On these I remember running a series of "Hopalong Cassidy" Westerns. 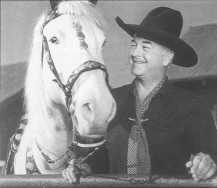 Hopalong Cassidy was played by William Boyd. The Pye telecines weren't all that good, but just about adequate for their day, in contrast to the Cintel 35mm flying spot telecines which gave superb picture quality - 405 line tv at its very best! We worked long days, starting at 9am and, as we were also on standby, had to stay right until the end of the day's transmission which could be anytime up to midnight. 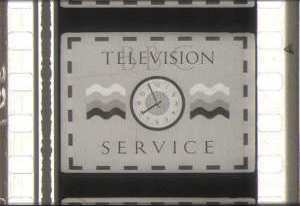 Programmes often didn't run to time in those days and in the evening it was a regular thing for the Presentation Assistant in Central Control to ring down to us with the enlightening message that "Oh we're running about an hour and a half late tonight..." Try that today! However, we were on shift - day on, day off. This was known as the AP Shift and it was great - we worked 7 days a fortnight, so on one week we would be on duty on - Monday, Wednesday, Saturday & Sunday, and then the following week - Tuesday, Thursday & Friday. It kept travel costs down, and we had two consecutive days off each week, as well as the other three single days! The idea of that shift was that since almost all programmes were transmitted live, it was the same people who had rehearsed the programme in the studio during the day who would put it out in the evening. However, should you, by chance, go into AP on one of your days off, you'd find it staffed in the main by complete strangers! In those early days I was staying at the BBC Hostel, in Bayswater, London, and often used public transport to get around. 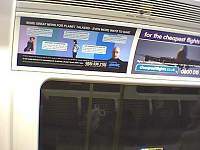 One day while travelling in the Tube (the London Underground train system) I spotted an advertisement on the wall. .... I only took two tablets, and after months of agony seem almost well again. Not quite what the advertisers intended I think!